I’m going to flunk school – I just can’t get into the hype of upcoming flick X-Men: First Class. Odd, considering its line-up is full of quirky odd-beat characters, and that's just the type of X-team I like. God knows I can't stand looking at a book where it seems like Xavier only trusts the war for mutant rights to the Swimsuit Illustrated crowd. Not only is 'difference' one of the core themes of the franchise, I want read about X-Men who actually look like X-Men (those ones mainly have the most interesting perspectives anyway). 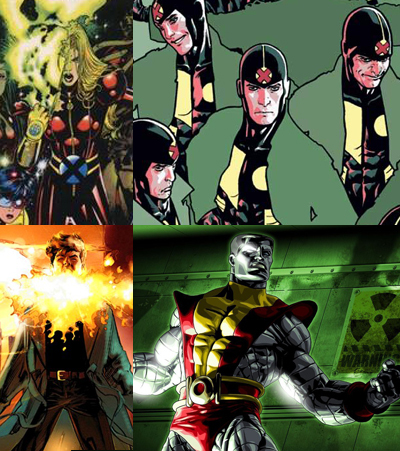 So my friends, let that serve as a loose enough segue into the obligatory post; the eight who make My Dream Team X-Men! ARCHANGEL An original X-Man, Warren is the team's financier and heavy-hitter. He also allows them to infiltrate the mutant hating side of society's wealthiest, busting mutant slave rings, sweatshops and more. NIGHTCRAWLER One of the best comic creations ever, Nightcrawler's strategy, faith and positivity make him the perfect leader of this team, and communicator for mutant rights to the wary public. STORM Kurt's 2-I-C, when Ororo desires to re-hone her skills, most think it's as an elemental powerhouse. Rather a re-mohawked Storm steps forward, dealing with matters in a more 'hand to hand' manner. 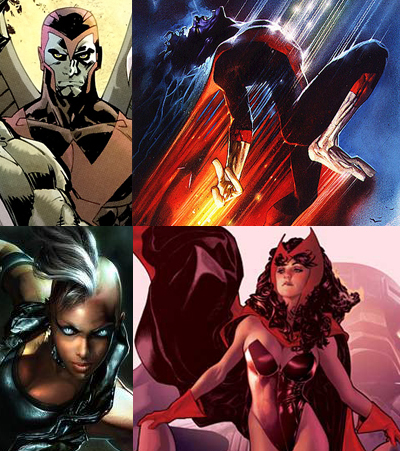 SCARLET WITCH With each X-revamp I’ve waited to see the daughter of Magneto pledge her experience into combating both the fascist elements of both homo sapians and mutantkind - forces like her father. HUSK Trumping Firestar for this spot, Paige's brother Sam gives her a Hellion connection too, but with her ability to shed her skin not limited to revealing human forms underneath, she is way more versatile. MULTIPLE MAN Who doesn’t dream of having Jamie Madrox's powers? Using the name Multiple Man (as no good codename should ever go lonely), one man army Madrox is invaluable in balancing the odds. CHAMBER A descendant of Apocalypse, Chamber and Archangel would make for awesome 'beer buddies'. Re-powered, the ‘untouchable man’ would seek to rekindle his relationship with Husk. COLOSSUS In my first Uncanny X-Men comic, Colossus was the only character I dug. Loyal and optimistic in an angst ridden, Pete's strength of character has rarely waivered. Plus he’s a giant man of metal - you can’t get better than that! So that's my Dream Team of Eight! Who makes up yours? about half of your team would be on mine. My wife would of course want to sub in Gambit, most likely for one of my favorites, but this isn't her list, is it? That's a pretty sweet line-up you've got there Craig! Iceman was a close contender for my crew too - I never play Marvel Ultimate Alliance without him in my crew! Storm, Scarlett Witch and Colossus look awesome! those were some good character illustration selections Dan. I've thought down this road before, but I'm not sure I have 8. Lemme get back with ya. . .
Colossus and Storm are both Video Game based art David, and Scarlet Witch is by the unbeatable Adam Hughes - so I'm sure you already guessed that one! That's a pretty good way to break it down Craig - puts my thinking to shame! I tried to keep the uber powerful to a minimum, but other than that just went with who seemed to click. I love the idea of putting Husk and Chamber on the team together. :) Kudos Dan. Remember that kiss back in Generation X when they blew the roof off? I laughed so hard Diet Coke came out my nose. Anyhoo, here's my two cents. I sure do Random - that made me actually lol to - long before people knew what lol was! I'm ahead of my time I tell you! I knew you'd chose Blink too! Storm, Nightcrawler and Archangel are on all three teams listed so far - good to see a common theme starting! Alrighty. I finally narrowed it down. this is where I got hung up. The old nostalgic in me wanted Firestar and Iceman, to make it sort of an Amazing Spider-Friends awesomeness tribute. Nightcrawler, Kitty, Colossus, Magik, Rachel, Warpath, Sunfire, and Scarlet Witch. Awe. Some. Thanks guys - and welcome to IADW Justin, glad you like what you've found here - I'm glad you stop in! @ Justin - I'd definitely grab that X-Men line-up too. Having the big strong guy and gurl in Uncanny X-Force would make it pretty damn near irresistible! @ Doug Jeez doesn't it seem ages ago that we did this for the JLA Doug? I agree Nightcrawler is the unsung leader of the X-crowd. Hopefully he returns with the upcoming relaunch! I like the addition of Warpath too - he was always my favourite X-Forcian and I kinda hoped he'd flick over to the big leagues or the Warriors! As I said in my post Firestar was close in my line-up too so glad I wasn't the only one who went down that road. Sunfire makes it really feel like the international line-up of Giant Size X-Men, and Scarlet Witch - well you know she's a weakness of mine - so I'm sold! !